SunEdison and Enel Green Power lead the pack, according to GTM Research. The results are in: SunEdison now tops the developer rankings for Latin America. The new Latin America PV Playbook shows that the utility-scale market in Latin America is truly buzzing, with developers flocking to the region and more project contracts being signed than ever before. Large international companies dominate the rankings, in terms of both operational capacity and pipeline. SunEdison leads the market in operational capacity, with 100 megawatts more than the next-ranked company, Enel Green Power. The top three companies have almost all of their capacity in Chile, except for one smaller project by Enel in Panama. Solarpack has a mix of projects in Chile and Peru, and T-Solar and Gestamp have their operational capacity in Peru. Gauss operates the largest plant in Mexico, a 39-megawatt plant in Baja California Sur, with Eosol running the second largest in Durango. CFE, the Mexican utility, developed two smaller projects -- and Greenergyze worked on the largest project currently operational in Central America, a 6-megawatt project in Guatemala. Enel Green Power leads the region in terms of pipeline, with more than 1 gigawatt of pipeline focused in Chile, Peru, and Central America. Alen Walung, a little-known company, is in second place, with more than 1 gigawatt of permits filed with the Chilean environmental agency. Cox Energy, Ingenostrum, First Solar, Avenir, Rijn Capital and Pattern Energy also have their entire pipelines in the Chilean market. 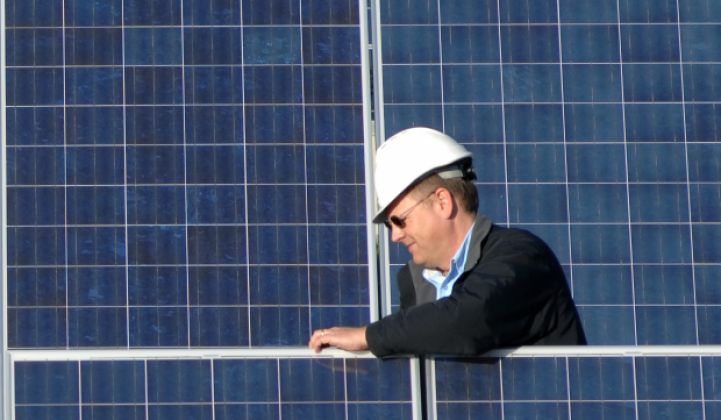 SunEdison has a more diverse portfolio, with projects in Chile, Mexico, Brazil and Central America. Mirroring the operational capacity statistics, eight of the top 10 companies with pipeline are international players. However, the remaining two local companies are based in the Chilean market, which has the most potential for pure-play activity. There are three trends to watch in 2015 and beyond. The first is that Enel Green Power is likely to gain market share on SunEdison as the year progresses, with pipeline in Chile and strong positioning for the Peru auction. Gauss and Gestamp are also likely to rise in the rankings, with Solairedirect breaking into the top 10. Second, we expect more pure-play developers to break into the rankings as time goes on. This trend has already started to manifest, with newly announced capacity and newly contracted capacity in the fourth quarter evenly split between international and local companies. It is notable that more developers are reaching the contracting phase is because although announcing projects doesn’t cost anything, there are high costs involved in moving a project to the point where it can secure a contract. This indicates that local developers have tapped into more working capital, and are thriving in markets where local expertise is highly valued and there are a limited number of truly bankable projects. This morning’s announcement that Rijn Capital had secured financing from Corpbanca for a 54-megawatt project reinforces this view. Of course, many of these projects are ultimately acquired, as was recently evidenced in Brazil, where local players Solatio and Renova sold stakes in newly contracted projects to SunEdison, Canadian Solar, and ACS. With more than 2 gigawatts expected in 2015, the Latin American region must be taken seriously by any company looking for a diversified downstream portfolio and high-potential emerging markets. For more information on the Latin America PV Playbook, visit http://www.greentechmedia.com/research/report/latin-america-pv-playbook or contact sales@gtmresearch.com.